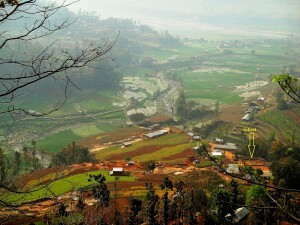 Scarcity of drinking water is one of the prominent problems faced by the people living in the hilly regions of Nepal. Often women need to walk long distances in order to collect drinking water, sometimes this can take half of the day! In Ratmate, it doesn’t take half the day, but fresh drinking water is still not easily accessible, with water sources far away from the communities. This is also a problem for the Shree Ganesh-school, a school with 600 kids up to 12th grade. This school does not have access to piped water, and the nearest water source can only be reached by walking a dangerous path. With the Commitment Award prize money, Brandt School alumni class-of-2015, Krishna Giri was able to construct a 2.5 km long pipe line, a big water reservoir and two taps near the school. After many years of struggling, students are relieved from the big problem of collecting the drinking water. And not just the schoolchildren benefit from these new pipes, inhabitants of nearby communities are also using the pipes before and after school-times. When Nepal was struck by a major earthquake in April 2015, the water system was also damaged, mostly because the water resources were shifted 30 meter down, so a new intake point for the pipes had to be constructed. With the help of international NGO’s, this problem was quickly solved, so the schoolchildren of Shree Ganesh school can easily enjoy fresh drinking water once again!